Luke joined the Coast Guard reserves in 2010 as a maritime law enforcement officer. 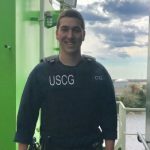 He spent the first five years of his reserve career in a deployable operation group unit, and the last two on a vessel security boarding team in Portsmouth, Virginia. This summer (2017), he will attend the Coast Guard reserve Officer Candidate School and hopes to receive a billet as an intelligence officer. In his civilian career, he has worked as an assistant department head at a golf course in Watertown, Ma, and a military tuition assistance and veteran’s benefits representative at a large university. Luke graduated with his Bachelor of Business Administration in Business from American Military University in 2015, and his Master of Business Administration degree from Liberty University in March of 2017. In the fall of 2017, Luke will attend Washington and Lee University School of Law (Class of 2020).